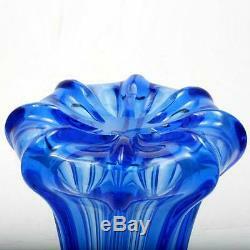 Flint Glass Pillar Mold blown Cologne Scent Bottle Cobalt Blue Antique Crystal. 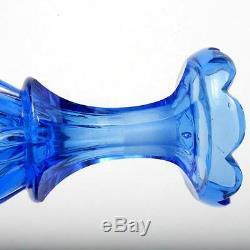 Cologne or Scent bottle is a wonderful Cobalt Blue in colour with a clear crystal stopper. It may have been produced in England or in the USA, Pittsburgh glass were especially known for Pillar molded items. This piece would have been produced between 1840 and 1870. The bottle measures 9" in height and 3.5" in diameter. The body, flared at the base, has the rise and fall of the pillar mold. The neck has been cut into panels, as have the scallops around the rim. The stopper is hollow inside and has also been cut with panels. This piece is in exceptionally good condition. It has a little wear to the stopper and one pin point nick on the scalloped rim but no other chips, nicks or cracks. 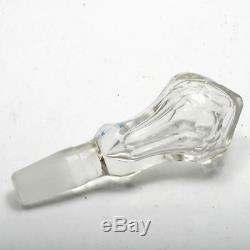 This piece would make a remarkable addition to any antique glass collection. 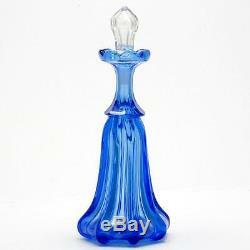 The item "Flint Glass Pillar Mold blown Cologne Scent Bottle Cobalt Blue Antique Crystal" is in sale since Sunday, July 31, 2016. This item is in the category "Pottery & Glass\Glass\Glassware\EAPG Pattern Glass 1850-1910\Flint". The seller is "catisfaction" and is located in Lynnwood, Washington. This item can be shipped worldwide.